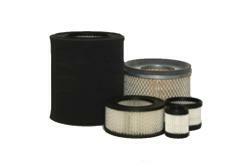 Offering a complete line of air-intake elements, Behringer is an excellent source for air filtration in such applications as Blowers, Dryers, industrial Mobile Equipment, Injection Moding, etc. Media Options Include Economical Paper Media/Special Paper Polyester Blends. End Caps are Molded Rubber or Metal.